Posted on 1, March 2018 by EuropaWire PR Editors | This entry was posted in Education, Entertainment, Science, Technology, United Kingdom and tagged art, British Science Week in Leicester, BSW18, engineering, Luke Jerram, maths, Museum of the Moon, Professor Turi King, science, technology, University of Leicester. Bookmark the permalink. LEICESTER, 01-Mar-2018 — /EuropaWire/ — For an out-of-this-world experience in Leicester – head over to the spectacular array of events being held as part of British Science Week in March. 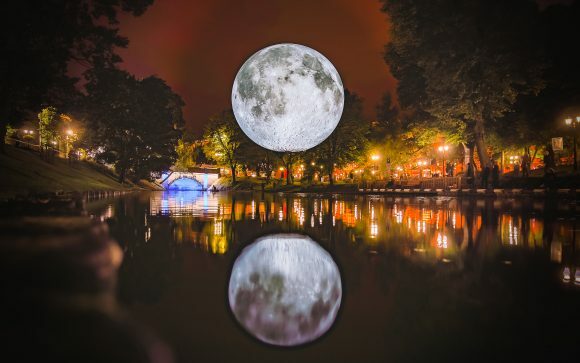 There’s a giant moon for a start – the Festival sponsored by the University of Leicester literally kicks-off with a huge recreation of our nearest neighbour, which will be hanging in Leicester Cathedral for the duration of the festival. Luke Jerram’s Museum of the Moon is a new touring artwork by UK artist Luke Jerram. Professor Turi King, Professor of Public Engagement, said: “We are inviting people to share with us the wonder of science and its ability to excite and inspire. A wide range of venues are coming together to play host to some fantastic scientific showcases. School visits and open sessions, visit our web pages to find out more. An exhibition showcasing collaborations between artists and scientists. Displays and demonstrations of the best of Leicester science. Offering school students the chance to hear from the scientists who analysed King Richard III’s remains, including our own Professor Turi King. BBC star and geneticist Adam Rutherford gives an exclusive talk. Book your place now. Our panel of experts take your questions live on BBC Radio Leicester. Leaders from across the city discuss what happens when science and religion cross over. Book your free tickets now. A performance of Bach’s Concertos under the Museum of the Moon. Tickets available here. This city event sees a huge range of family-friendly activities. The National Space Centre will be running events throughout the fortnight from a 10k virtual ‘space race’ to displays on Leicester’s role in space exploration. British Science Week, run by the British Science Association is a celebration of science, technology, engineering and maths, featuring entertaining and engaging events and activities across the UK for people of all ages. The campaign provides a platform to stimulate and support teachers, STEM professionals, science communicators and the general public to produce and participate in STEM events and activities across the UK. Last year, over 230 events, reaching nearly 1 million participants, took place across the UK.